Apple’s MagSafe connector has saved literally millions of laptops from destructions caused by tripping over one’s power cord. But with the introduction of USB-C on new MacBooks, this safety feature is absent. 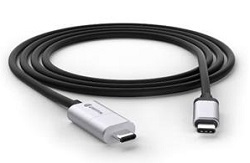 Use BreakSafe's included 6' USB-C cable with the USB-C charger that came with your laptop. Designed for use with the new USB-C compatible MacBook and Chromebook Pixel laptops, BreakSafe is compatible with USB Power Delivery and is rated up to 60 watts (20 volts @ 3 amps). Please note that BreakSafe is for charging power only; data and video are not supported.